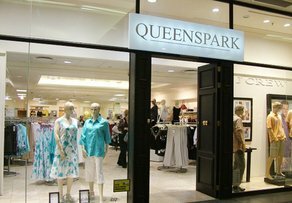 Queenspark is a well-known clothing and accessory franchise that was founded in the 1980s. The style is elegant, timeless and fashion forward. They support several other brands including JCrew Man (which offers fashionable clothing and accessories for men), Queenspark Plus (which caters to the fuller figured woman) and Trend (which offers a large range of make up and accessories). Queens park also offer a range of fashionable shoes and accessories to complement the clothing that they sell. Queenspark’s designers have created beautiful, classic, elegant pieces for both men and women for a long time. The focus of the design is beauty and practicality. You will not find revealing mini skirts in tartan at this store. Most of the pieces you will find on offer at Queenspark can be worn by women and men at work. There are several formal items of clothing which will do perfectly for events, parties or conferences. There are, of course, many casual wear items, but these still stay true to the ideal of beauty, practicality and elegance. Who should shop at Queenspark? If you are an adult of any age or gender, if you are looking to portray an image of yourself as elegant, classy and stylish, if you want to look good, reliable and business like for work, if you want quality clothing that is worth the money you spend on it and that will last you a good long time, if you take pride in the way you look and dress and have a well developed sense of style, if you are curvaceous or trim, if you are looking for a store that caters to all aspects of style and dressing and if you are looking for clothing that is affordable and beautiful, you would benefit from shopping at Queenspark clothes and fashion stores. Where can you find a Queenspark franchise? There are many Queenspark stores throughout and beyond the country. You will most likely find a store close to you or close enough for a short trip. Wherever your closest branch is, the clothing, accessories, shoes and make up that you will have the opportunity to choose from will be worth the travelling. The stores include: a branch in Gaborone, Botswana, branches in Port Elizabeth, Greenacres and Hemmingways in the Eastern Cape, branches in the Mimosa Mall and Loch Logan in the Free State, branches in the Vaal Mall, Brooklyn, Bedfordview, the Mall at Reds, Westgate, Centurion, Rosebank, East Rand Mall, Sandton, Kollonade, Oakdene, Vereeniging, Benoni, Cresta, Fourways, Menlyn Park, Clearwater, Eastgate, Woodlands, Maponya Mall, Irene Village, the Grove, Northgate, the Mall of the North, Trend and J Crew Man in Gauteng, branches in Inkwazi, the Pavillion, La Lucia, Musgrave, Pietermaritzburg and Gateway in Kwazulu Natal, a branch in Polokwane, Limpopo, branches in Nelspruit, Witbank and Middelburg Mall in Mpumulanga, a branch in Windhoek, Namibia, branches in Rustenburg and Mooi River Mall in the North West, a branch in Kimberly in the Northern Cape and branches in Tygervalley, the Waterfront, Cavendish, Somerset West, Canal Walk, George, Paal, N1 City Mall and the Blue Route Mall in the Western Cape. If you wish to find your local Queenspark, contact them or the headquarters, inquire about a specific piece of clothing, pair of shoes, item of make up or accessory, order something in or make a suggestion or complaint, you can find all the information necessary on the ‘contact us’ page of the website. Simply visit www.queenspark.co.za and select either ‘contact info’ or ‘contact’ at the bottom of the home page. You will then be provided with all the contact details and information necessary to get in touch with the staff at Queenspark.